HKScan wants to help consumers to live tastier, but also more sustainable lives. Material efficiency and recycling are essential parts of HKScan’s environmental responsibility. As the next important milestone in the packaging roadmap HKScan will replace all non-recyclable black plastic packaging with other colours and possibly also with other materials by the end of 2019 in Sweden and in Finland. -The food industry can be more progressive and take ambitious steps towards responsible material usage throughout the value chain. The message in IPCC’s recent climate report was clear: there is no time to waste. All industries need to do more and work faster. We have speeded up our development to respond to this - replacing black plastic packaging with other colours and materials is a concrete step towards the right direction, Heli Arantola, EVP Categories & Concepts, says. In Finland replacing black plastic packaging is already proceeding. -We have transferred to using yellow plastic with Kariniemen® products. HK® brand starts to move away from black plastic packaging gradually. The role of black plastic decreased significantly already during 2018, Kati Rajala, EVP Market Area Finland, says. Black plastic is not recyclable because the optical sorting system used for recycling cannot detect the black carbon pigment used to colour the plastic. According to Eurobarometer in 2017* 94 percent of the respondents found industry and retailers reducing plastic packaging to be the most important measure in reducing plastic waste and littering. -The decision to move away from black plastic packaging in Sweden and in Finland is a strong promise to decrease our environmental impact and enabling the reuse of materials. We are developing a road map also for Denmark and the Baltics – we want to show the way in all our markets, Arantola continues. Consumers value the ecological aspect of the package, as well as usability and informativeness. Consumers are looking for packages that are made out of recyclable material, are not “overdone”, can be further utilized and contain instructions for disposal**. -We want to do our utmost to develop packaging to be more sustainable and correspond to the expectations of the consumers. We have introduced a number of packaging technologies in our markets that improve product usability and decrease environmental impact, Arantola says. In Sweden, the Mamma Scans meatballs packaging has been developed. The new packaging reduces the use of plastics by 30 tonnes a year. In Denmark, Rose® has introduced new packaging made out of transparent, recycled plastic. In Baltics chicken and pork sashliks and marinated meat are sold to consumers now in easy-to-carry bags instead of plastic buckets, reducing the use of plastic by approximately 70 percent. 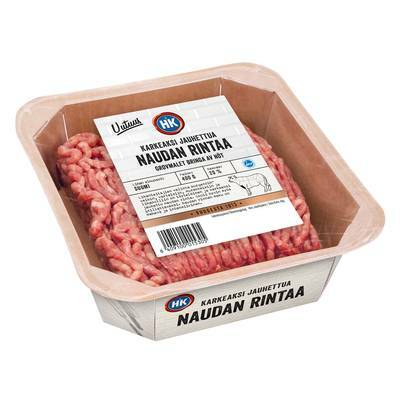 In February, HKScan will introduce two new minced meat novelties to the Finnish market. Novelties will be packed to recyclable cardboard packaging. This Finnish innovation produces 80 % less plastic waste. HKScan is actively working to enhance material effectiveness and recycling. We also support initiatives for sustainable packaging solutions that can reduce food waste with material choices and qualities. Packaging is only a small part of the whole meat product carbon footprint. Therefore, special attention should be paid to the prevention of food waste. When only a couple of ham cold cuts from a package go to waste, it creates a bigger environmental effect than the production of the package itself. -Food waste is a significant factor. Today, approximately one third of all bought food goes to waste, so we all as consumers have a big responsibility. The goal of our packaging design is to ensure product safety, shelf life and to increase recyclability of packaging materials, Arantola explains. In 2017 HKScan reported for the first time the amounts of packaging materials used, and their sources. -In 2017, 38 per cent of our packaging materials came from renewable sources. From this figure, approximately a fifth was from recycled materials. We aim to material efficiency without compromising product safety, Arantola says. In Sweden HKScan is committed to follow the vision declared by the Swedish Food Retailers’ Federation. The federation has stated that all plastic packaging shall be recyclable by 2022 and all plastic packaging should be produced from renewable or recycled raw materials by 2030. To achieve this vision HKScan has started a sustainable packaging project to define activities to increase usage of recyclable materials and materials from renewable sources. HKScan is a Nordic meat and meals company. We employ over 7 300 professionals in striving to serve the world's most demanding consumers, maintaining quality throughout the full chain of operations, From Farm to Fork. HKScan produces, markets and sells high-quality, sustainably produced pork, beef, poultry and lamb products, as well as charcuterie and meals, with strong consumer brands, including HK®, Scan®, Rakvere®, Kariniemen®, Rose®, Pärsons® and Tallegg®. Our customers are the retail, food service, industrial and export sectors, and our home market comprises of Finland, Sweden, Denmark and the Baltics. We export to close to 50 countries. In 2017, HKScan had net sales of EUR 1.8 billion, making us one of Europe’s leading meat and meals companies.